A Turkey Exploded! - "A Parcel of Strouds, Duffields, Blankets, Silver Trinkets and other suitable Articles for that Trade." 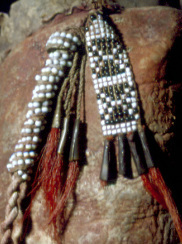 A number of threads have appeared in the “Native American Reenacting” section of the Frontier Folk Message Board (http://frontierfolk.net/mb/) in the past year which attest to the widespread misunderstanding of 18th century Indian hair ornamentation practces for all regions of North America. It would be easy to launch into a tirade about all of it, but once again, I will restrain myself to discussing the Southeast only. I probably need to apologize to the readers who will be offended by this in advance. standard, copying the art really means copying another reenactor. Not the best method of research and interpretation. How many “trophy” coats appear in Griffing’s work? How many appear in the historic record? Before I digress too much, I need to redirect back to the issue I said I am going to rant...er... talk about: hair. 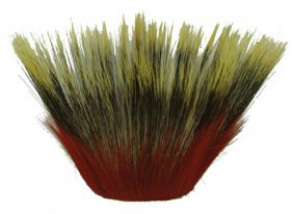 North, South, East, and West, the two most common forms of hair ornaments employed by Native reenactors are deer and porcupine hair combination roaches and/or split turkey feather roaches in various combinations. 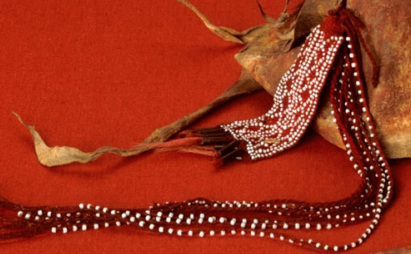 Unfortunately, these items are the absolutely least documentable types of hair ornaments for the 18th century! So why are these first choices for so many folks? Well, they look cool. 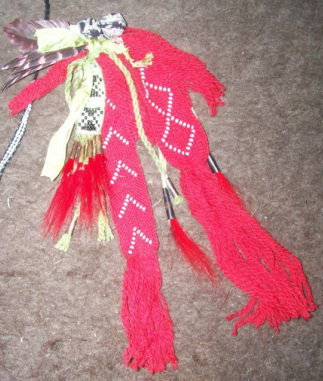 They look “Indian.” Tons of people sell them for really cheap. Finally, they show up in the works of modern artists constantly. Yes, we do find split feathers on a few diadems and other types of headdresses, and what are very likely PEACE pipes... and there is a destinct lack of split feathers ornamenting anything associated with conducting war. Mike Galban posed the idea some time ago that the split feathers could specifically be a symbol of peace... a symbolic removal of the fletching from arrows. I believe this theory has quite a bit of merit. 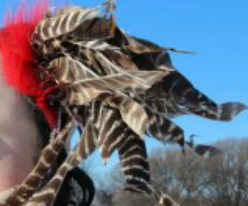 So, combine this with the complete lack of support for the wearing of split turkey feather head ornaments and we have a pretty good argument on our hands against them! So we cannot document split turkey feather roaches and deer/porky hair combo roaches (or turkey beards for that matter), what can we document? There are actually tons of alternatives found in period illustrations and descriptions which are not only far more authentic, but also often easier to obtain and less expensive. 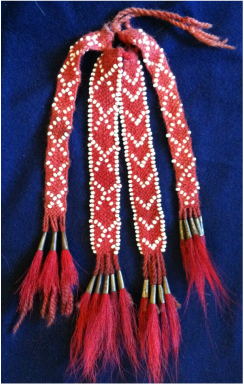 In the Southeast, finger woven hair garters seem to have been very common, as were small heddle woven bead hair fobs. Even more common were a couple of feathers - not the split and curled type, but down and full feathers, often dyed red. 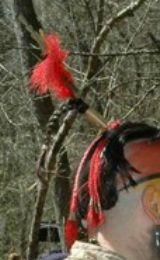 Among the Southeastern tribes we also find frequent mention of river cane worn in the hair. It is very likely that these were just short sections of cane slipped over a braid or chunk of longer hair. There is also plenty pointing to absolutely nothing being worn in the hair. Simple is always a good option as there is less to go wrong. Another option is a European hat. Both wool felt hats (cocked, uncocked, trimmed with lace, and plain) and worsted knit caps appear in the Native sphere from an early date. 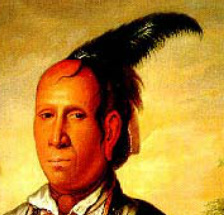 While we dont seem to have any 18th century images of SE Natives wearing them, there are a whole bunch of images from the third quarter of the 19th century of Indians in the Northeast wearing hats and caps. 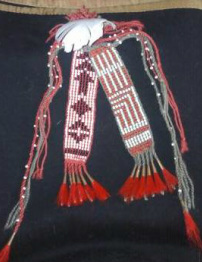 As these items appear with equal frequency in the NE and SE, it is pretty safe to say that both were being worn quite frequently by Indians. Sadly, most Native interpreters do not feel they are "Indian enough," and opt for something outlandishly "Indian." In the end, the options one is left with leaves one looking less like a modern painting and more like a period image. But that is the point; or it should be anyway. We have a responsibility to accurately portray the past. My advice to the novice and veteran alike is to constantly re-evalute your gear. Our interpretations should be ever evolving. Rather than look at the latest print from X artist, turn to Bartram or Adair and see what the guys who were actually there witnessed. The writings are noticably devoid of split turkey feather hair ornaments and deer/porcupine hair roaches. The following are a few images of reproduction hair ornaments made by myself and Nathan Kobuck (bottom right) which are pretty firmly rooted in the historic record of the Southeast.